Horace Lamb made important contributions to applied mathematics, in particular to acoustics, seismology and fluid dynamics. He is best known for his book Hydrodynamics, which with his several other textbooks played a major role in university teaching and research for many years. 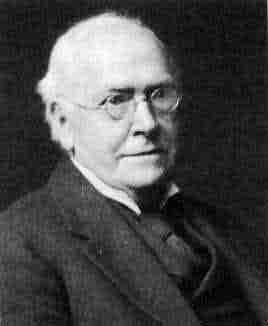 After his mathematical studies at Cambridge, Lamb was appointed in 1875 to the Chair of Mathematics at Adelaide. In 1885 he returned to England to take up a Professorship in Mathematics at the University of Manchester, and became the first holder of the Beyer Chair of Applied Mathematics in 1888, which he held until 1920. Under his influence the Mathematics Department at Manchester grew rapidly. Elected to the Royal Society in 1884, he was a member of the Council of the Society and twice its Vice-President. Lamb received the Society’s Royal Medal in 1902 and in 1923 was further honoured with the Copley Medal. A strong supporter of the London Mathematical Society, he served the Society as President in 1902-04 and received its De Morgan Medal in 1911. Lamb was knighted in 1931.